History of number starts from primitive age of human being. The development of number system has integrated with the development of human beings. In primitive age, people used to count stones and pebbles. Hindu philosophers have developed the number system called decimal numbers. From the number various other numbers are derived and developed. These numbers are binary numbers, octal numbers, hexadecimal numbers etc. The number of base or radix ten is called decimal numbers It is first number system in which all the ancient and modern mathematical calculation is done. Other number system is derived from this number. It is generated with the combination of 0, 1, 2, 3, 4, 5, 6, 7, 8, 9. We can represent these numbers with suffix two. Eg (9810)10 The following chart displays relations among several number systems derived from the decimal number. Binary Number is a number of two base numbers. It is represented by 1 and 0. 1 or 0 is called Binary digits. We can generate this number with the combination of 0 and 1. It is represented with suffix two. Eg (10101)2. 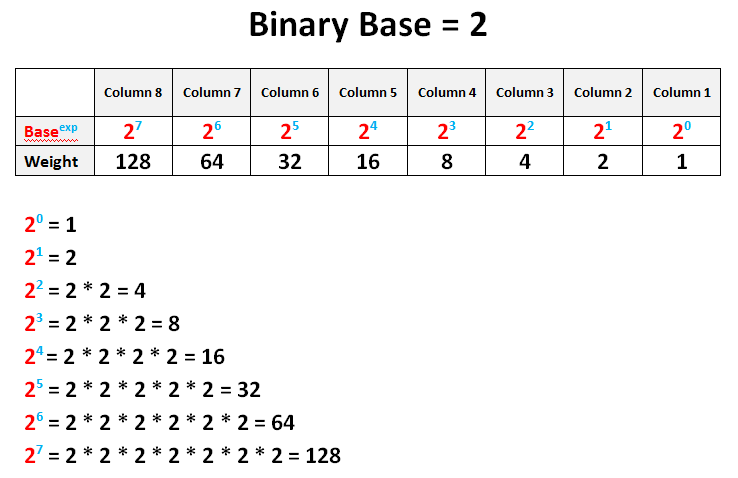 Following table shows some decimal number and their equivalent binary numbers. We multiply each binary digit by its weighted position, and add each of the weighted value together. To convert decimal number to binary number,repeated division by two is needed. From the number various other numbers are derived and developed. These numbers are binary numbers, octal numbers, hexadecimal numbers etc. The number of base or radix ten is called decimal numbers It is first number system in which all the ancient and modern mathematical calculation is done. What is number system? What are its types? A number system that uses ten different digits to represent different values is known as decimal number system. The base of decimal number system is 10 because it consist ten digits from 0 to 9. Decimal number can be expressed by using powers of 10. How can we convert decimal into binary? A positive decimal integer can be converted to binary through successive division by 2 till the quotient becomes zero and sequential collection of remainder on last come first basis (i.e. bottom to top). How can we convert decimal into octal? A positive decimal integer can be converted to octal through successive division by 8 till the quotient becomes zero and sequential collection of remainder on last come first basis (i.e. bottom to top). How can we convert decimal into hexadecimal? A positive decimal integer can be converted to hexadecimal through successive division by 16 till the quotient becomes zero and sequential collection of remainder on last come first basis (i.e. bottom to top). But the remainder 10 or above is represented by the capital letters from A to F respectively. What is binary number system? A number system that uses two different digits to represent different values is known as binary number system. The base of binary number system is 2 because it consist two digits 0 and 1. Each digit of the binary number system is called Binary Digit (BIT). The binary number system is used in the computer. How can we convert binary into decimal? The decimal equivalent of a binary number is the sum of the digits multiplied by 2 with their corresponding weights. How can we convert binary into octal? Octal digit is represented in 3 bits. So, a binary number is converted to its octal equivalent by grouping their successive 3 bits of the binary number starting from the least significant bit (right-most digit) and then replacing each 3 bit group by its octal equivalent. How can we convert binary into hexadecimal? Hexadecimal digit is represented in 4 bits. So, a binary number is converted to its hexadecimal equivalent by grouping together successively 4 bits of the binary number starting from the least significant bit (right-most digit) and then replacing each bit-group by its hexadecimal equivalent. A number system having two base numbers is ______. What is the decimal value of the binary number 111? What is the decimal value of the binary number 1000? What is the binary value of the decimal number 45? What is the binary value of the decimal number 226? The number of base or radix ten is called ______. The base of decimal number system is ______. The base of binary number system is ______. Any Questions on 'Decimal and Binary Number '?